The site for the new University of Monterrey PREPA (High School) campus competition is located in Valle Alto, in the outskirts of Monterrey. Currently the site is occupied by an equestrian club. The campus will have over 10 acres with a capacity for 900 students. The existing site has a great beauty and a very attractive integration of buildings and nature. 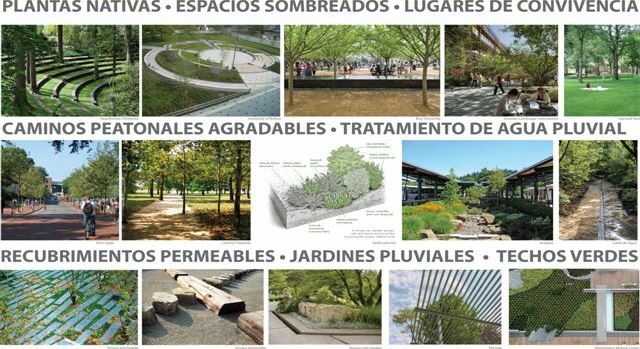 The main intention of the proposal is to integrate the various buildings and landscape design with the existing environment. Considering the listed assumptions the master plan proposes a consolidation of the built footprint by proposing a series of 2-3 stories high buildings, a bi-level semi-buried parking garage, and by recycling some of the existing buildings. The heart of the school is the "Green Square", a smooth rectangular space, surrounded by classrooms, the library, the administration building, a café and the multipurpose building. Due to its characteristics the Plaza Verde becomes the great social and civic space. Rows of trees provide a continuous shaded perimeter around the Plaza. The project was developed with a strong sustainable approach, and is expected to earn a Gold level LEED v3 certification.